It was a pretty easy finish. 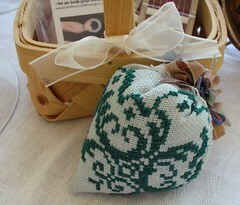 I think I would definitely like to make another one, except this time on a smaller count linen. 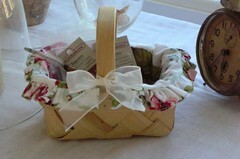 I wanted a little basket to hold some of my needlework accessories and remembered I had one in the closet. I asked my mom if she could make me a liner for it and she got right to work. I think it turned out so cute! The sunflower bellpull and the strawberry look great. 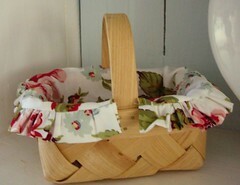 Love the fabric your mom used on the little basket. Seven months already? Were does the time go!! Love your Sunflower Sampler! It is looking great! I have this in my rotation...after seeing yours I pulled it and all the threads and am going to start it! I love your strawberry finish :) Congratulations! Your Sunflower Bellpull is coming along fantastically. I love the strawberry. Love your bellpull, I so love Sunflowers. 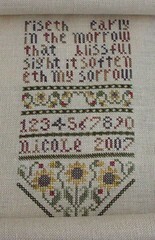 The Sunflower Bellpull looks great, can't wait to get mine stitched. The strawberry is so cool. Congratulations on the basket finish, looks fab. Is it really 7 months, he'll be walking and talking in no time. the strawberry turned out great! Love your strawberry! Your mom did a great job on your basket liner too...what a great idea!